It’s an unforgettable moment and Norma Shearer plays it with just the right amount of humor and vitriol–she’s nobody’s fool and absolutely her own woman. So where did the actual oft-mentioned siren shade originate? 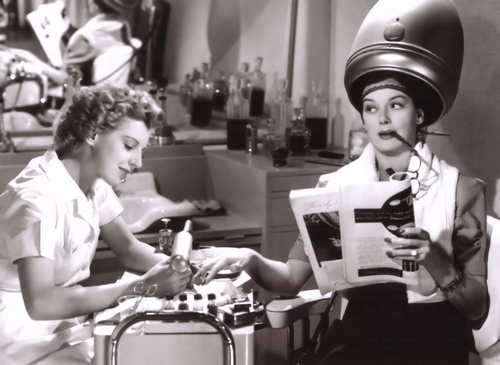 Although it’s suggested at a swanky Manhattan beauty establishment at the beginning–(Sydney’s by name), it is also applied by a somewhat vulgar, gossipy manicurist–Olga who was fired from Black’s Fifth Avenue sometime earlier. This resplendent ravishingly and risqué image appeared on the back pages of the surprising, ‘Popular Song’ sometime prior to either the original play or the later film. Boldly featuring the announcement of a wicked new shade for lips and fingernails- Jungle is feverishly described as vivid, brighter–willingly able to make you into the most disarmingly dangerous dame this side of the south seas. This would have been the kind of makeup that girls, likely from poor or working class backgrounds would favor. It was meant to suggest in no uncertain terms that the brand and the shade were capable of making the wearer irresistible glamorous daring, an almost volcanically intense object of desire. Bringing this back into the film–this all makes perfect sense. Duplicitous, disastrously loud-mouthed, gossip-ridden beastly blabber-mouthed, Sylvia Fowler suggests the shade after hearing a racy tale regarding Mary Haines perfect paragon (tall, fair distinguished’ an engineer), of a husband, realizing the second Mary puts on a coat or two of the tantalizing polish, the whole gruesome story will pour forth. It’s the first of two cinematic examples of how this shade is also a weapon; it leads to harmful gossip, that literally rips apart a supposedly elegantly ideal marriage. Jungle Red, our newest color was new in 1936 and seen to provocative excess in the kind of magazine (Screen Stories, True Confessions, Popular Song), that a manicurist or a shop girl would be likely to read. 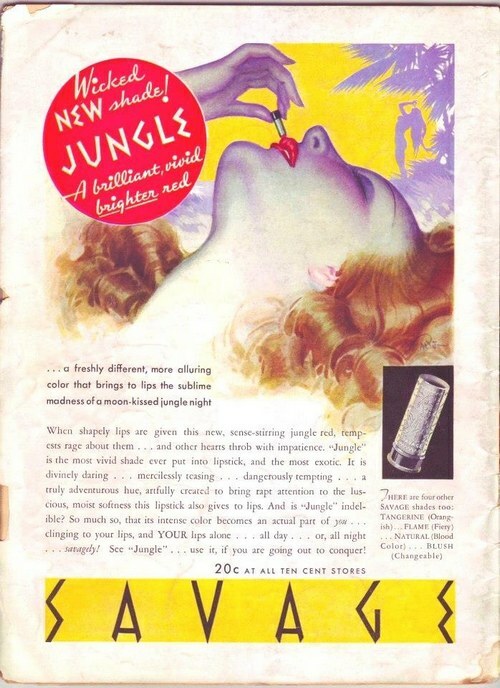 The shade Jungle and brand name, Savage, would have been sold in the five and dime, or the local drug-store thus equating in, in thirties parlance as common, vulgar and most definitely cheap. Each of these qualities is exactly what those untrustworthy supposedly straight-arrow spouses seem to fall for- a duo of the leads looses her man to respectively a shopgirl and a chorus dame!